You’ve finally reached the point in your high school career when your math teacher is telling you that a graphing calculator is mandatory, or at least highly recommended. For too long you’ve long been sitting there with your simple little scientific calculator, marvelling at how quickly your classmates can solve problems with their fancy TI-84’s. You know that it’s time you make the plunge and spend some money on a new calculator, but you’re not sure where to start. There are so many graphing calculators out there. How can you possibly choose? Look no further – our guide will help you make the right choice, and you’ll see your marks improving in no time. Math, physics, chemistry, calculus, statistics, econ – no matter the subject – a graphing calculator will help you improve your grades. First, and most obvious – it allows you to graph functions. This is extremely helpful when working with linear, quadratic, and polynomial functions, among many, many others. It allows you to graph lines, parabolas, cubic functions, and calculate the points of intersection. Second, the nature of the visual input allows you to intuitively manipulate algebraic equations through the clever use of brackets and stored answers (from previous lines of work). This is extremely useful when working with precise numbers involving many digits and scientific notation (think mole calculations in chemistry or force of gravity calculations in physics). Third, the ability to use and edit programs. There are countless programs, particularly within the Texas Instruments community, that will simply make your life easier. And yes, there are games available – but as a teacher, I cannot vouch for their use in improving your grades. While of course all graphing calculators offer the ability to graph and plot functions, they can also do anything a regular or scientific calculator can do. A scientific calculator is one that contains a little bit more than the usual operations ( ), such as the trigonometric functions, sine, cosine, and tangent (SIN, COS, TAN), their related inverse functions, logarithmic operators, and the natural logarithm with its inverse . These are essential capabilities for any student taking high school math or science beyond grade 9 or 10. The sooner that students become comfortable with the functions and capabilities of their visual display, the easier it will be to solve complex problems in an efficient manner. This type of efficiency is often the difference between an A and a B on a difficult test with a time limit. Understanding the nuances of your own calculator is extremely valuable and often overlooked. 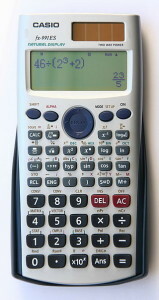 Many students think that all calculators are the same, and have no problem borrowing one for a test. Our experience as teachers shows us that this is simply not the case. A calculator is an extension of your brain, in some respects, and requires that you are comfortable with the its work flow and required sequencing of using functions, brackets, and operations. Each calculator is unique, and it’s important to find the one that is right for you. Of course, it is the graphing capabilities that most students want to make use of when they are first using a graphing calculator. Students are usually quite amazed at how easily they can graph a function, and wonder why nobody showed them this sooner! Most application problems (you know, those dreaded word problems about trains, planes, projectiles, maximizing revenue, finding the normal force or coefficient of friction) in algebra classes can be more easily solved and understood when graphed. Graphing the equations you are trying to solve gives you a visual representation of the functions, and allows you to see what exactly it is you’re solving for. The majority of us are primarily visual learners, and a graphing calculator greatly adds to the learning process. It has to work for you. There are varying levels of power, sophistication and capabilities in graphing calculators, and it’s important to choose the one that’s right for you. For the high school student who just got comfortable using a regular scientific calculator last year, it is best to start with a more basic model, such as a TI-83 or TI-84. Both are quite user-friendly, with large easy-to-read buttons and excellent display of numbers, functions, and parentheses (or brackets). The 2nd (and 3rd) functions. Every graphing calculator (and most scientific calculators) will have a 2nd or SHIFT button that allows you to toggle each button’s other function. For example, the SIN button also contains SIN-1, which is the inverse of the regular trigonometric function. It is used to find the value of the angle when you already know the ratio. Many calculators have so many extra functions mapped onto the keys that it can become cluttered, difficult to read, and overwhelming. If you look at a calculator and don’t understand what the majority of the keys mean, try looking at a different model. For most purposes, at the high school level you don’t really need all the 3-D graphing capabilities that the higher end models offer. It is more cost effective and probably better for the learning process, to simply stick with the tried, tested and true models that students have been using for years. What is it capable of graphing? Be sure that the calculator you choose is able to do what you need it to. If you’re planning on going on in mathematics, science, or business, it is certainly worthwhile to consider a higher end model that you will eventually ‘grow into’. There are many incredibly powerful things that the latest models of graphing calculators are capable of doing. Some are more tailored towards graphing inputted data for statistics courses, while others are designed with algebra and calculus students in mind. Does it allow for downloading apps and programs? Believe it or not, there is a thriving community of people creating apps for graphing calculators, and they’ve been doing it for far longer than iPhone or Android developers. There are countless apps available for the TI brand of calculators, for all variety of subjects and courses. They can usually be found for free on the texas-instruments website or even directly on developer sites. Many TI app websites exist. At the high school level, having a good quadratic solver app is invaluable. Once students understand the graph of a parabola and how the a, b, c values affect its shape and intercepts, they usually learn how to use the quadratic formula equation. It is a tedious and time-consuming process that eventually results in determining the x-intercepts or roots of the quadratic equation. Some students who struggle with arithmetic can complete perhaps 2 or 3 problems in 10 minutes or so. With a quadratic solver app, the roots are solved instantly and we are also offered a graph of the equation, its vertex, maximum or minimum value, and a variety of other characteristics commonly tested in high schools around the world. Students should of course know how to find the values by hand, and the calculator simply comes in handy as a tool to check answers and confirm understanding. Through carefully structured lessons and problems, teachers can make use of quadratic solver apps to further students’ understandings of the material. Is it really worth spending over $120 on? How much do you already spend on tuition, laptops, binders, books, clothes, phones and tablets in the back-to-school season? Surely a standalone device that is designed to help calculate and solve problems is a worthwhile investment. The calculator is a device that can’t be used to ‘multitask’ the way phones and tablets do – on a graphing calculator, you can’t send photos, send text messages, or go online. When a student is using it, they are almost certainly being productive. It actually is at least five or six times ‘better’ than the $20 scientific calculator you had been using before. First of all, it allows you to graph, which is really the basis of much of high school algebra and calculus. Secondly, the ability to review previous lines of calculation and use the values in later lines is not only convenient and helpful, but also a good tool for learning from. Students make better sense of the order of operations by typing in their equations line-by-line rather than number-by-number. It has excellent longevity. The graphing calculator I have been using since high school (my trusty TI-86) is still alive and kicking more than ten years later, and with the exception of predating USB technology, it is still as useful as it was ten years ago. Graphing calculators are generally sturdy and well-made, and the majority carry warranties of some type. Be sure to ask when purchasing. It has resale value. If you decide after high school that you’re done with math, science, and business calculations and don’t see yourself using it in university, you can easily sell it or pass it down to a younger sibling. These calculators have changed a bit over the years, but are not going out of date every 18 months like cell phones now do. So which is the best graphing calculator? Like we said earlier, it really depends on what you are going to use it for. Take your time in browsing each calculator’s specs and reading the user reviews on Amazon. Ideally, you can try a friend or colleague’s first to see if you like it. Make sure it’s the right one for you. The chart at the top of this page compiles what are, in our opinions, the top 5 choices out there right now.